What? Old meme is old? As you can see, it’s very bare bones. Much more simplified and abstract than previous maps that I made when I was thinking primarily from the perspective of an RPG campaign setting writer heavily influenced by the maps of the Forgotten Realms, Eberron, and Grayhawk. But now that I am looking at it more from the perspective of a Sword & Sorcery writer, maps of that kind really seem like total overkill. And even when you look at RPGs that are not D&D, a great number of them have maps that are just as much detailed as this one, if not even more simple. The only case where you really need a big map with satellite photo type detail is when you’re doing hexcrawling games. When you’re looking at campaigns and adventures that are more story driven and, dare I use the term, “cinematic”, you don’t really need a map. Star Wars doesn’t have maps. Indiana Jones and Mass Effect have maps that are no more detailed than this one. 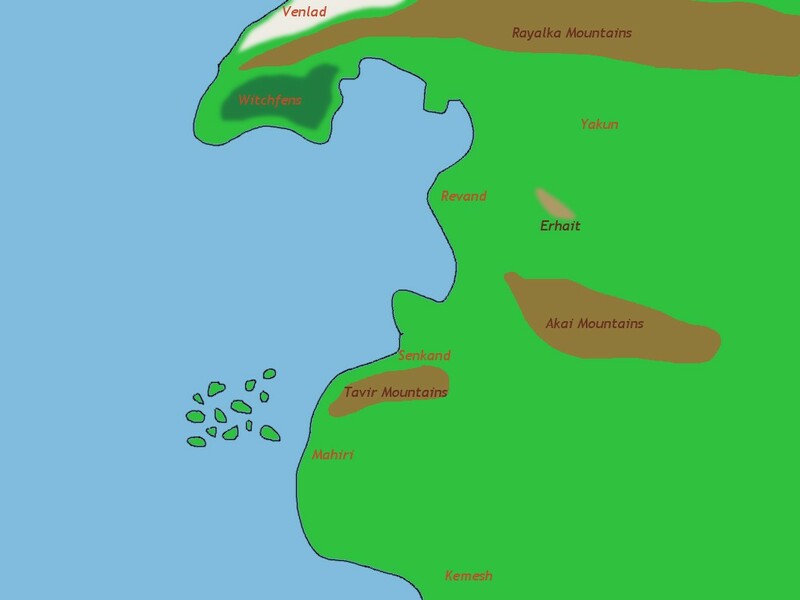 The maps of Conan and The Witcher are like this, and Kane and Barsoom don’t have any. Satellite photo maps are only useful when you’re tracking daily movement through trackless wilderness. Otherwise you can simply say “the party leaves the village and after a number of days they reach the city”. If you remember earlier maps (I doubt I have any regular readers that devoted), you might notice that there are considerably fewer regions on this one than there had been before. This week I did a lot of consolidating and discarding redundancy, which did help quite a bit in making the world feel more crisp and having a sharper profile. Someone I mentioned this to quoted some French artist who said “Perfection is reached not when there is nothing left to add, but when there is nothing left to take away.” Which I can get behind. The number of different peoples is down from 20 to 12 with lizardmen being completely gone, monsters are down from 110 to 50, and I discarded all the gods of intermediate power between cosmic forces and local spirits of the land. It’s an animistic world after all. You don’t need the god of hunting. Hunters in any given place only need their spirit of hunting. And the same approach also went into redesigning the map. In my current work to sharpen the profile of the Ancient Lands setting I am creating, I started looking deeper into the old Planetary Romance genre. In many ways it’s “Sword & Sorcery with laser guns”, but I would say it usually has a more grander scale and glamorous atmosphere to it, which I really love. The old Star Wars movies (and the most recent one) really are much more Planetary Romance than Space Opera, which is the genre of Foundation, Lensman, and Enders Game. Mass Effect, which very greatly inspired me, is both. The business with the Reapers, Cerberus, and the human Systems Alliance is classic Space Opera, while the story branches that deal with the Krogan and the Quarians feel very much like classic Planetary Romance to me. While looking for more in-depth information about the stylistic elements of Planetary Romance, I came across this interesting article adressing the feeling of ancient history that you find in the old Star Wars movies. (I am in agreement that the Expanded Universe mostly missed this aspect.) Basically, Star Wars feels ancient because even though the technology is much more advanced than ours, it is used in very antiquated ways. The Empire builds huge mechanical war elephant. Intelligent robots are treated and traded like slaves. And of course you have knights fighting with swords. There’s a princess and the big bads are adressed as Lord and as Master. Despite the technology, Star Wars really feels like its the ancient past, not the distant future. And that got me thinking. Certainly you could use the same technique to make a relatively generic fantasy setting not feel like the late middle ages, but as being set thousands or even millions of years earlier in the history of their planet. Robert Howard set the Hyborian Age of his Conan stories in an age between the sinking of Atlantis and before the start of the Neolithic, but is often rather inconsistent in making it really feel that old. When people are trying to put Conan into pictures, they usually cheat a bit and don’t show the armor and weapons that are actually described and replace them with something more ancient Greek looking. So I started thinking about elements that I would identify as visual clues that a story is set in an age long before the emergency of equivalents to medieval France or England. And I turned up with a surprisingly lot. Giant Lizards: Reptiles today are small. Millions of years ago Reptiles could be huge. You don’t have to have actual dinosaurs, but something that looks like it could have been a dinosaur certainly should do the deed. Volcanoes: Given the total age of the Earth and the amount of time between today and the dinosaurs, it seems very unlikely that volcanoes had been much more common during the time of the dinosaurs than they are now. But for over a century, all decent artists painting prehistoric animals put volcanoes in their pictures! It doesn’t make sense and it doesn’t have to make sense. Volcanoes just feel and look very prehistoric. Bronze Armor: As I mentioned above, one of the big things where Conan stories feel anachronistic is armor. And it’s something that makes a big difference. Put your heroes and soldiers into bronze breastplates and give them crested helms and big round shields and you instantly have a very different feel than warriors in steel plate armor or chainmail. Oracles: What knight has ever gone to an oracle? Ocasionally you have someone secretly consulting a witch in the night to gain forbidden knowledge. But making a pilgramage to a sacred oracle to recieve the wisdom of the gods is something very un-medieval. Slaves: When these come up in medievalesque fantasy it’s usually in the form of organized crime. But you’ll almost never see the average noble or wealthy merchant having lots of slaves in their homes and as their workers unless the story wants to point out that they are dispicable villains. Skulls: “Why skulls? !” After the great plagues of the late middle ages skeletons became a fashionable motive in art, but usually we consider skull decoration as something primitive and savage. But there isn’t any reason why you can’t have depictions of human and animal skulls in the decoration of the homes of the rich and powerful. Sacrifices: For reasons I don’t know Christians and Muslims don’t do sacrifices. Which gives it a feeling of being primitive and barbaric. But during antiquity many extremely advanced civilizations sacrificed animals to their gods and of course you can also have them sacrifice people. That really sets a very different tone for a fantasy world. Cannibals: Have you ever had a knight deal with people who eat people? Animal Gods: Again, in western thought, humans are created in the image of god. The Greeks did it too. To my knowledge only the Egyptians had gods with Animal heads, but during the middle ages it has always been popular to depict pagan demon-gods with animal features, and we still associate animal features with deities of primitive societies. Also always fun is having your people worship Old Gods like Cthulhu, Yog-Sothoth, or Shub-Niggurath. As long as it doesn’t look human it’s fair game. Scrolls: Wizards and sages love their books. But there isn’t any practical reasons why you couldn’t also have them read from scrolls. An interesting alternative to parchment or papyrus is strips of bamboo sewn together with thread, so that each bamboo splint holds one line of text. Clay Pots: These never disappeared and where still very common during the middle ages. But in antiquity pottery really was the way to go for all kinds of containers. Switch some wooden tankards for clay cups and some barrels for amphoras and your tavern will feel a lot more ancient. Ziggurats and Pyramids: The only true way to build a giant temple or palace. Halls of Pillars: Before the Romans figured out how to make a self supporting arch, it was really difficult to hold up a large ceiling. While stone is very hard when you press down on it, it actually snaps very easily when you bend it unless you make it really thick and put the support pillars very close together. (Karate chopping roof tiles and cinder blocks isn’t nearly as hard as it looks.) 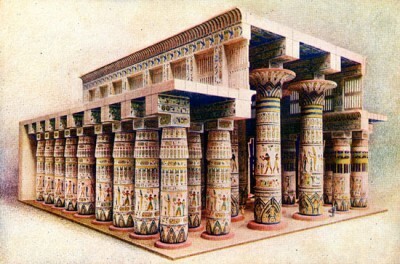 In Egyptian temples you often can’t see the hall for all the pillars which take up half of the floor space. The Greeks got a bit better by cheating and making the roofs out of wood (which is why the Acropolis hasn’t one anymore), but they still needed a lot of pillars and interior walls. Consider this when describing palaces and temples. At least some people might unconsciously make the association. People interested in Fantasy and especially the aspect of worldbuilding probably have encountered expressions like “his writing has a great sense of history” or “you should describe the world as if it is history”. I’ve seen it applied to both Robert Howard and Tolkien several times, but it tends to show up in many diverse places. There is something about these expressions that sounds very profound to me and I have feeling that I understand what people are getting to when they use it. But what does it actually mean? How do you write your fantasy as if it is history? The most obvious answer to that question would be to write a big and comprehensive history book that deals with the great rulers, powerful dynasties, and big battles between the great powers of the world. But that’s almost certainly not what people mean by that, and it would also be completely impractical. Aside from being a huge amount of work, how would you bring any of that into your story so that your audience learns about it? And even more important, that they care about it? And when we turn to Robert Howard’s Conan stories, which are regularly getting praise for the sense of history they contain, we actually don’t find any of that. The most we get for almost all the countries are names, as well as the names of maybe one or two major cities. Occasionally the name of a ruler who is currently plotting against Conan, but that’s all the present, not the past. Some weeks back I was reading some articles about the Conan story Beyond the Black River by people with a very strong interest in historical fiction, which directed my attention to another perspective on the subject. In that tale Conan is some kind of “military advisor” who is using the skills and knowledge he learned as a boy in a barbarian tribe to teach and supervise civilized soldiers who are trying to claim new territory for settlement from the local barbarians. Then the natives are getting restless and Conan is really the only one among the good guys who is capable to deal with true savage warfare. The story has been described as being a fantasy adaptation of tales from the American Frontier, but it could also be a fantasy adaptation of the Romans crossing the Rhine or the Vikings crossing from Greenland to the American mainland. It’s not the classic history book type of history that deals with kings and generals, but much more similar to the currently very popular kind of history that examines how people lived and what they were dealing with at the lower levels. It’s about how things were normally instead of the exceptions when extraordinary things were happening. Especially when it comes to early (colonial) American history, there seems to be a very high interest in the personal stories of interesting individuals that have been preserved, even if their deeds are completely irrelevant when you take a more global view spanning centuries. Part of it is probably necessity because at the time there were no big kingdoms, powerful kings, or many huge battles. But even the tales of a hunter who became an important translator for solving a few specific conflicts between locals and settlers can get very exciting because they are windows into the world of those people involved, to which we otherwise have very little access. When we write down such tales of our own ancestors, we usually refer to it as History. But what it really is is Ethnography. A description of the culture and everyday life of specific groups of people. Not necessarily of an entire population, but also of more specific groups like the American frontier men. Or the Skandinavian sea merchants, or the Roman legionaries on the German border. I think that this is the true sense of history. The feeling that these people we see in the story could actually have lived and that they have a complex and fascinating culture, even if we only get a very short glimps at them. Another thing that regularly appears in various Conan stories and which makes them different from most other adventure tales, is that his stories regularly intersect with what are important “big history” events. We only see what Conan does and encounters, but the people he fights against or for are generally involved in some pretty big business. There are big things happening in the history of the world, but instead of seeing them in the big picture from above with the kings and generals, we usually get a look at them directly from the ground where you can see only a very small piece but with details usually invisible in Epic Fantasy. Think of the opening of the movie Gladiator. We see the Roman general Maximus in a major battle against German tribes. We are not told what the battle is about. Why the German warriors are attacking, why the Romans are in the area, or how long the campaign had already been going. And once Maximus is betrayed and has to flee, we never learn how that war between the Romans and the Germans turned out. But during this early part of the movie there is a clear sense that this battle is not some random border skirmish that happens once every few weeks and is of no consequence in the greater picture of things. This is something important. A decisive battle in a very important war. The Emperor himself comes to the front to see Maximus in person because he has very big plans for him, based on his leadership during this campaign. We are getting a clear sense that there is an important war going on and that even more important things lie ahead for the future of the Empire. But we don’t actually see any of that. Because it’s not relevant to this particular story of Maximus being betrayed, believed to be dead, and becoming enslaved to be a gladiator. And from that point on his future in the higest ranks of the Empire becomes irrelevant to Maximus. This is a deeply personal story, but it takes place in a location and time where big historic things are happening. We are getting a sense of history, without actually seeing it. The other writer next to Howard who often gets praised for creating a sense of history is Tolkien, and The Hobbit is perhaps the best example to see that. For Bilbo it is a completely straight adventure tale. Go places, encounter monsters, return home rich and wiser. But for the dwarves it is an important episode of their history. It’s not just a single adventure but a big turning point that completely changes the power structure in the region. But the tale is Bilbo’s tale and so when the big battle between all the regional powers takes place it’s done in three or four paragraphs because Bilbo was mostly sitting this one out and had nothing really to do with it himself. But you know that his individual adventure takes place before the background of big historic events. It is examining the situation and changes of a fascinating time through the events that happened to a few interesting, though also not really special individuals. Individuals who are not the big masterminds behind the big events or who single handedly decided the outcome of large scale conflicts through their actions. To create a sense of history, you don’t need to go into detail about politics and battles. It really is about creating an atmosphere of the protagonist being surrounded by people who have a real culture, and also a past and a future. Star Wars: Tales of the Jedi is a comic series that was published by Dark Horse from 1993 to 1998 with a total of 35 issues. This was only two years after the Thrawn Series by Timothy Zahn had kickstarted the Expanded Universe as we know it now, placing it pretty early in the history of Star Wars tales. 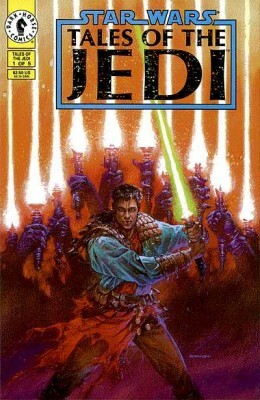 The series was created by Tom Veitch, who had written the Dark Empire comic series a year earlier (which I consider the greatest travisty of the Star Wars universe after the Holiday Special), but he was joined by Kevin Anderson in 1994, who had just released his Jedi Academy novel series (which also has a pretty poor reputation among fans) and became the sole writer for the series a year later. The Tales of the Jedi are set 4,000 years before the movies, in a time when the Republic was still smaller, the galaxy less explored, and the Jedi much more numerous. The first three story arcs, written by Veitch, (and giving us the now popular title “Knights of the Old Republic”) follow the adventures of the young Jedi Ulic Qel-Droma and his brother Cay and their fellow knight Tott Doneeta, who are send to the planet Onderon to help the government of the capital city end a war with the tribes living in the surounding jungles. They discover the spirit of the Dark Jedi Freedon Nadd manipulating the events on the planet, facing the three Jedi with a much bigger threat than they anticipated. As the crisis escalates, Ulic’s path crosses with the newly trained Jedi Nomi Sunrider, who has an exceptional talent for the Battle Meditation technique, which allows a single Jedi to coordinate the efforts of an entire army and making her extremely valuable. Once Kevin Anderson joined as second writer, he introduces Exar Kun, a character from his Jedi Academy novels, whose spirit is trying to turn Luke’s Jedi students on Yavin 4 to the Dark Side. Exar Kun is unhappy with his master not trusting him to learn about the dangerous powers of the Dark Side and so sets out to learn more about them on his own. A path that very much mirrors that of Anakin Skywalker in the movies that were made a few years later. Exar Kun gets corrupted by the still not fully destroyed spirit of Freedon Nadd who leads him to the ancient Sith tombs of Korriban, where he once more unearthes the ancient secrets of the Sith. At the same time Ulic Qel-Droma is trying to infiltrate the leadership of a new Sith cult called the Krath who also have been guided by Freedon Nadd and establishing their own galactic power by allying with the Mandalorians and become a major threat to the Republic. Halfway through the arc, after the Dark Lords of the Sith series, Veitch left as a writer, leaving the field entirely to Anderson with the Sith War series. A third main arc is set a thousand years earlier and centers on the first clash between the Republic and the Sith Empire under the leadership of Naga Sadow, who uses trickery and conspiracy to first destroy his rivals for control over the empire in The Golden Age of the Sith and then sets his eyes on the Republic in The Fall of the Sith Empire. A final, much shoter arc called Redeption, is set some years after The Sith War, but is mostly a personal story of Nomi Sunrider’s daughter Vima and doesn’t really add much to the historic lore of the Old Republic. The setting of these comics would later return on the Knights of the Old Republic videogames, which right after the release of the second game got another comic series also, and confusingly, called Knights of the Old Republic. I was interested in those comics and had read the Jedi Academy novels at some point in the late 90s, so I decided to start at the very begining with the Tales of the Jedi series to know more about those references to Exar Kun, Ulic Qel-Droma, and Naga Sadow. When I first read them some three or four years ago, I quite enjoyed them. But having read them again over the last two weeks, my opinion of the series is now very different. The first arc, written by Veitch, is really pretty bad. The art is very sloppy and ugly, characters are as flat as it can get, and what little traces of a plot there are are almost entirely told by exposition in boxes with the characters not really contributing anything with their own words. The second arc, begun by Veitch and Anderson, is a noticable improvement in that the art now looks only bad and that the plot consists of exposition in speech bubbles instead of boxes. It’s still a bad comic, though. The third arc, now done completely by Anderson alone, first starts surprisingly well with Golden Age of the Sith. The art has now been upgraded to simply ugly, though servicable, and there’s actual plot and Naga Sadow has some real personality as we follow him taking out his rivals and becoming new Dark Lord of the Sith. Sadly that didn’t last and The Fall of the Sith Empire is right back to being a jumbled mess of exposition. The short Redemption at the very end is okay, I guess. I still don’t think it’s any good or very interesting. So yeah. My final impression of the Tales of the Jedi series is that it’s bad! There are noticable improvements over time, but those are simply from “godawful” to “only bad”. The only reason why I would recommend to anyone to read any of these comics, would be a great interest in the lore of the early days of the Star Wars universe. But even then I would say that only The Golden Age of the Sith and The Fall of the Sith Empire are worth it. If you really want to know about Ulic Qel-Droma and Exar Kun, then you’re much better of at just reading the page on Wookiepedia. There is so little plot and characterization in Veitch’s comics that you really are not missing out anything. It probably is much more exciting to read a detailed summary than to shovel your way through that pile of dung yourself. When trying to write Sword & Sorcery stories, I often end up discarding an outline because my initial idea doesn’t really offer much of an actual plot. The first observation I made is that any story that would be considered an action adventure tale needs four basic elements to be great. The first three seem completely obvious, but I realized that many of my initial ideas were really lacking both clear antagonists and conflicts. A travel adventure can make without them, but for Sword & Sorcery they are essential. 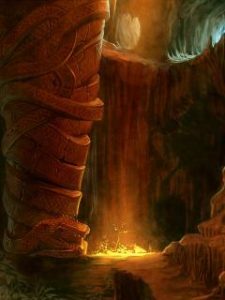 (A memorable location is technically optional, but I think any adventure story benefits hugely from having a climactic scene take place on a really awesome stage.) So I sat down and went through all my favorite fantasy stories to see what the basic type of conflict in them is and hopefully find some useful pattern that helps me with coming up with my own plots. All of them would be what critics call “person against person” conflicts. “Person against nature” and “person against self” are pretty much nonexistent in heroic fantasy adventures. (Though Kane occasionally goes there in addition to fighting with lots of other people.) While looking primarily at fiction, all of them actually make for great adventure hooks for RPGs as well. Rescue: Someone else is imprisoned or trapped and the protagonist has to save him. Assault: Enemies attack a town, castle, or country to take control of goods, territory, or people. The protagonist needs to repell them. You could instead have the protagonist lead the attack, but that’s very difficult to present in a heroic way. (The Hour of the Dragon. This is a pretty quick and dirty list and such great stories as The People of the Black Circle and A Matter of Price really don’t fit easily into any of these categories. But if you’re in search of a good plot for an adventure story I think these are a pretty solid start.